Do you struggle with not having enough time to practice guitar? Are you unsure about what things to practice within your limited amount of time? You might not be able to increase the amount of your guitar practice time…but you can make the time you have a lot more productive. Your guitar practice is efficient when you don’t waste time on things that don’t move you towards your goals. You guitar practice is effective when you are able to achieve the results you want in your guitar playing. This guitar speed guide shows how to double your guitar speed and make your guitar practice very efficient and extremely effective. Consistency of your guitar practice is much more important than the amount of time you practice. Don’t be discouraged if you cannot find a large block of time to practice guitar. You may not have 1-2 hours to practice guitar every day…but everyone has 10-30 minutes to practice guitar. We all have some time for things that are really important to us. A musical skill is transferable, when it helps you improve multiple elements of your guitar playing. (Example: fretting hand technique, picking hand technique, 2 hand synchronization, shifting from string to string, muting string noise, fretboard awareness, improvisation and many more…). Guitar practice materials that improve more than one of these elements at the same time have some degree of transferability. String skipping is a technique with a very high degree of transferability. It trains your technique on both hands, challenges your 2-hand synchronization, and forces you to focus on muting unwanted string noise. The benefits of improving your string skipping technique transfer very well to other aspects of guitar playing. Legato technique (as another example) has a much lower degree of transferability. It focuses only on left hand technique (and some elements of muting string noise). 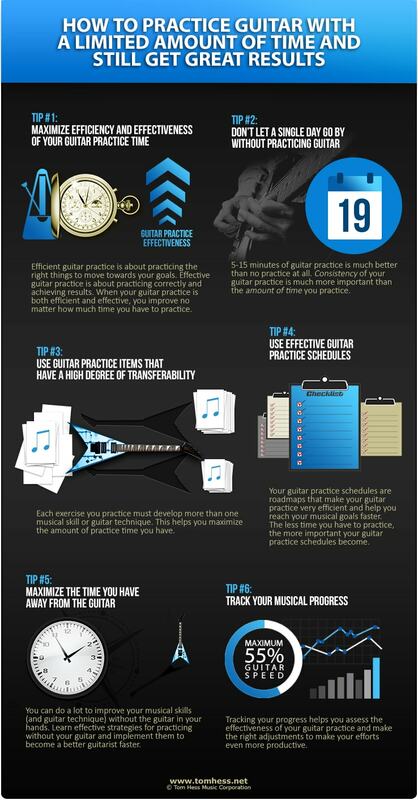 Most guitar players waste 40-70% of their practice time by not using effective guitar practice schedules. They under-practice some skills and over-practice others, practice elements of their guitar playing in the wrong order and practice mindlessly. These inefficiencies make it hard to reach your musical goals. Your schedules must be specific to your musical goals and flexible enough to adjust to your progress and any changes in your practice time. This article helps you create effective guitar practice schedules. You have a lot more free time during the day than you realize. You can use this time to improve your musical skills even without the guitar in your hands. Practicing ear training (singing scales, arpeggios and melodies) without your guitar. Practicing fretboard visualization by quizzing yourself on note names and writing out scale patterns on fretboard diagrams. Use the time you spend commuting to and from work (or school), eating, taking a shower, falling asleep as opportunities to improve your guitar playing. This time adds up quickly and helps you become a better guitarist. Tracking your results is just as important for your progress as practicing. It helps you assess the effectiveness of your guitar practice and make the right adjustments to make your efforts even more productive. Apply these guitar practice strategies to maximize your musical progress and become a better guitarist faster. This guitar technique guide helps you increase your guitar speed and make your guitar practice efficient and effective. Take heavy metal online guitar lessons and become a great guitarist fast.